This contemporary spin on country living by The Ranch Uncommon proves that natural wood accents don't have to come off rustic — they can also be totally sophisticated. Take the living room's open tower of firewood, which adds a visually compelling twist to typical log storage and complements the art piece over the mantel nearby. Meanwhile, the leather couch and ottoman further the down-home appeal of this room, especially given their matching animal hide accents. But because of the surrounding white walls and modern window seat, the space doesn't quite verge into traditional cowboy territory. So how do you tie a lasso around this design for your own home? Stay casual. Work with tough textures against a bright palette, and then mix in cowhides with chic lumbar pillows in laid-back colors. In the end, you should have classic ranch style with a modern finish. 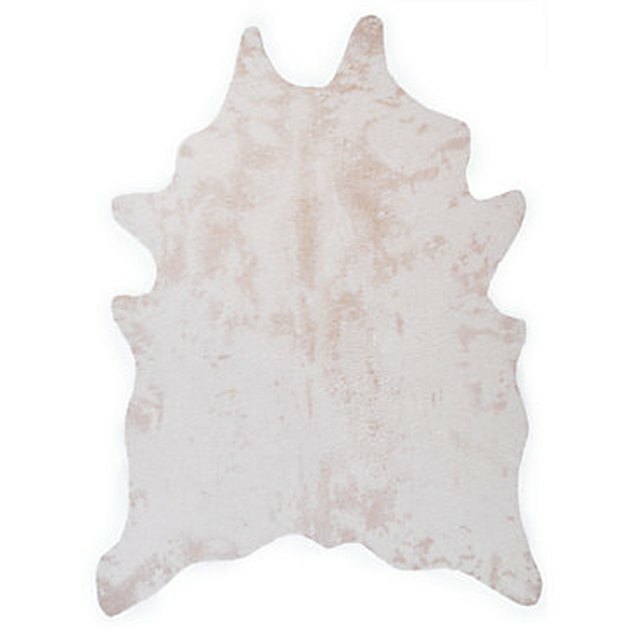 Steal this frontier look with a faux cowhide rug that can just as easily do double-duty on the couch.